Central to every athlete and weekend warrior is the recovery and performance of their muscular system. The Recovery Experience involves many disciplines to ensure each athlete or weekend warrior is fully prepared before, during and after an event. We offer strapping and taping, injury management advice, sports massage and Electro Muscular Stimulation. A Sports Massage works deep into the muscles, realigning the muscle fibres and connective tissue, and flushing away the toxins. Regular sessions will increase joint mobility and flexibility, and reduce the risk of injury during exercise. At EPT we have over 200 fully trained therapists across various disciplines such as Physiotherapy, Biokinetisists and High Performance Sports. 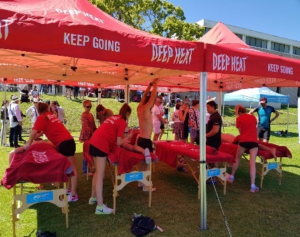 Each EPT therapist goes through a various accredited training bodies including a nationally accredited sports massage training course overseen by Swing Fit – the leaders in Sports Massage training in South Africa. Below you can find the link to the current events where we are taking pre-bookings for massages.